When Justin and I started planning our wedding, we knew almost instantly that we didn’t want real flowers. Don’t get me wrong, we had real flower centerpieces, but I always dreamed of keeping my wedding flowers, well, forever, and dried flowers were not something I looked fondly on. I decided I wanted to make a brooch bouquet. And then I had a mental break down and decided to do things my way (ask my mother, she received many sobbing phone calls). As a bride to be, I know you need options. So here’s how I did it. The first thing you need to decide when making your own flowers is whether or not you have the time to really make them and how far you want to go. When I decided I didn’t want a traditional bouquet, I quickly realized that I didn’t want to be the only one with a non-traditional bouquet, so my girls had to have them as well. 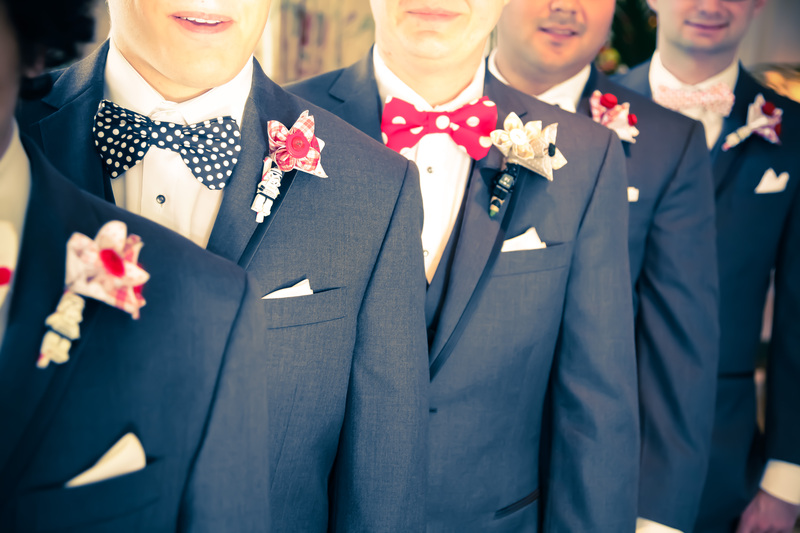 This lead to me deciding Justin’s groomsmen also needed something to match and before I knew it, I was making 7 bouquets and 5 boutonnieres on top of everything else for the wedding (including all the DIY paper projects I took on) and, you know, the easy task of raising an infant. I loved the personality of a brooch bouquet. I loved the idea of holding pieces from the women in my family with me as I walked down the aisle. I started with this amazing tutorial on Fancy Pants Weddings. I just could not get it to work. There was nothing wrong with the tutorial, in fact it was really helpful in getting my bouquet to where it is today. The style was not working for me and that’s okay. The key to making a perfect non-flower bouquet is to make it your own. 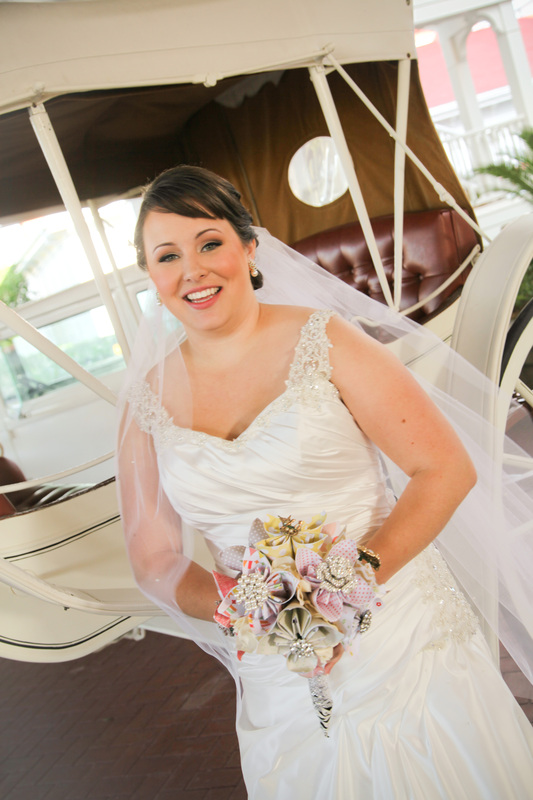 Throw out the preconceived image of what your bouquet should look like and you will start to love it so much faster. 1.) I started by folding scrapbook paper into petals following this pattern. I would cut the scrapbook paper into four squares, with each piece of paper making one flower. 2.) Then, I took each brooch (or stack of buttons) and wrapped them in wire. This requires some creativity but you basically want to wrap the heads so the brooches/buttons do not wobble at all. It takes some practice, but it’s very easy to get the hang of! 3.) After the brooches/buttons we wrapped in wire, I wrapped them with a heavy dose of floral tape. To give each stem more volume, so there would be more to hold, I placed each stem through a paper straw. 4.) When I had the stems, I glued each of the petals on so they brooch or buttons stood as the center of the flower. 5.) When I had completed all of the flowers for each bouquet, I took a silk hydrangea and put the stems in through different areas of the flower so each paper flower was surrounded by silk flowers on the bottom. Continue to do this until there are no blank spaces. 6.) Next, I bound the stems together. Some tutorials call for floral tape, but I felt I needed something way stronger so we used patterned Duct Tape. 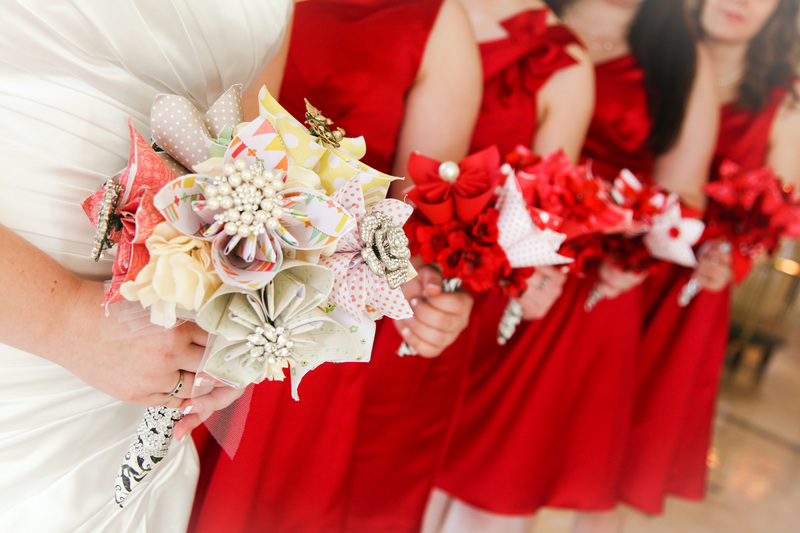 It gave all the bouquets a cohesive look and was kind of fun. 7.) TO hide the stemmy underside of the silk flowers, I tied a ribbon (or in my case, a piece of my mother’s veil) to the top of the bouquet and let it hang down. 1.) Follow steps 1-4 above. However, when you cut the scrapbook paper into squares, cut each square into four squares again. The size of the cut paper should be about the size of a Post-It. 2.) We added Lego characters to our boutonnieres using hot glue and extra floral wire. 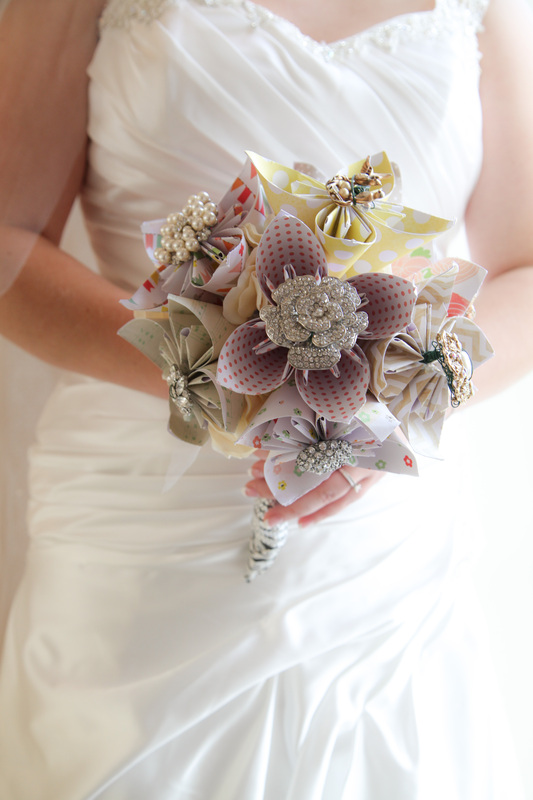 If you choose to make your own bouquet, know how rewarding it is! I love waking up each and every morning to my bouquet on my nightstand—almost as much as I love waking up with a wedding band on my finger! Stay tuned for more DIY projects from my wedding. Like this post? Pin it!